Arrival Delhi Railway Station, Meet & Assist further drive to Haridwar, enroute lunch. Later drive to Haridwar transfer to your Hotel. Visit Har-ki-Pauri for Ganga Aarti in evening. Back to your hotel, Dinner & Night halt. Morning, drive straight to Jyotirmath enroute visit Deoprayag, Rudraprayag & Karnprayag. On Arr. Jyotirmath, Check in Hotel. Overnight stay. Jyotirmath: Adi Guru Shankaracharya, who came all the way from Kerels in the 8th Century A.D, perform penance under a tree here and after getting enlightenment, established a Math (religious centre), known as "Jyotirmath". The name Jyotirmath is derived from it. Temple of Narsingh and Nav Durga are located here. Drive to Govindghat, Trek Start from here to Ghangaria (3000 mts). Check in Hotel. Ghangharia/Govinddham : 5 Kms. 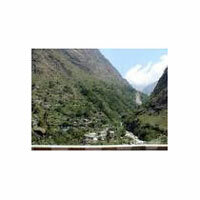 situated in the midst of a pine grove Ghangharia serves asa base for visiting Hemkund Shaib. It is the last human habitation in the valley. A tourist Lodge, log huts, tents and a Gurudwara provide comfortable accommodation.